Gokarna beach trek was in my travel list from many years, but didn't get a chance to visit this beautiful place. I visited Gokarna when I was 13 years old, but didn't went for the trek. So when I came to know about this trek from prakash, with out any second thought, I blocked my calender. 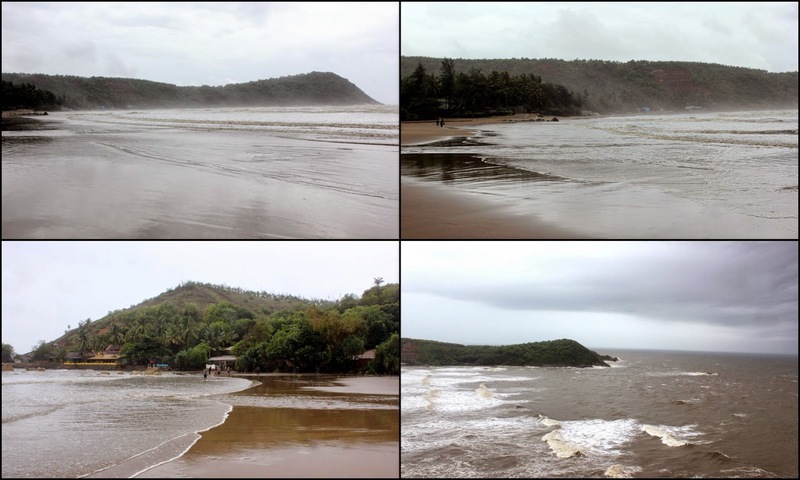 It was really a great experience visiting one of the best and picturesque beaches in India. There are very few good hotels in Gokarna town. So prefer staying in beach resorts. OM beach and Kudle beach have many beach resorts + budget accommodations. 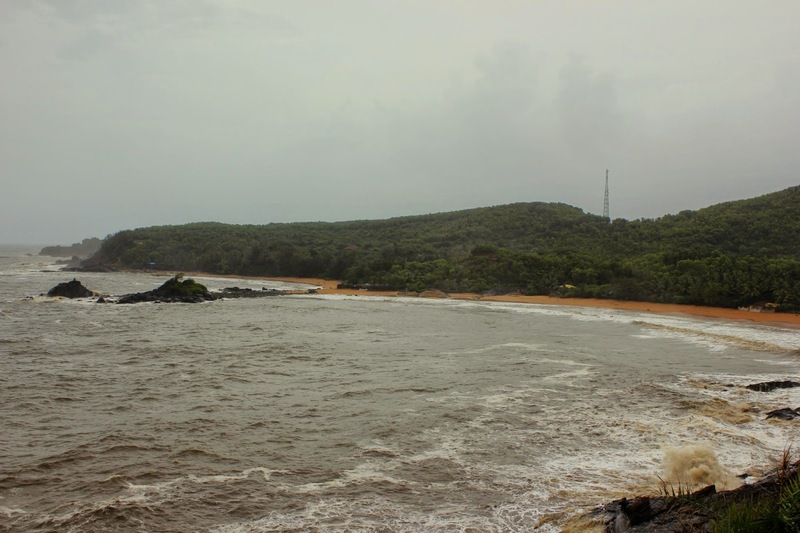 We reached the gokarna beach, located near the temple at around 10AM. This beach was not well maintained and we didn't dared to get inside the water because of the very high tides and uncleanliness. After spending few minutes near the beach, we walked towards the Rama Temple, from where our trek starts. By the time we reach the temple, there was heavy down pour and we were completely drenched in rain. I never experienced this kind of heavy down pour. Out of 15 people, half people opted for trail that goes through edge of the hill and other half opted for the flat walk trail. Of course, I always opts adventurous path. 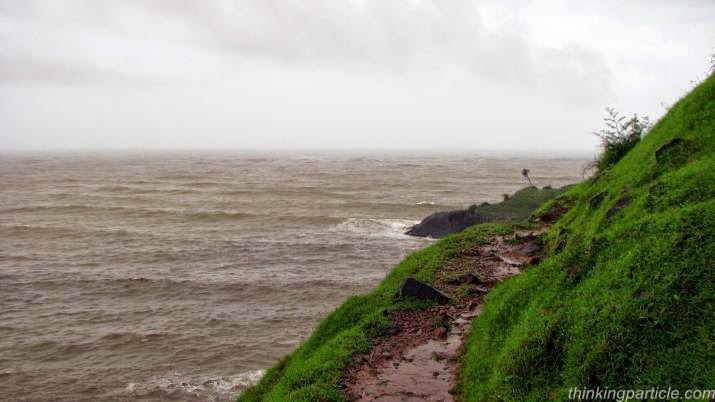 It was really a memorable experience walking on the edge of the hill and enjoying stunning views of Arabian sea. This trail lasted for approx 20 minutes and we reached the end of first hill. We climbed the second hill and after that it was a easy walk for 10 minutes to reach kudle beach. While every one was going on the regular path, me and prakash went off the path and trekked towards the one of the best view point of kudle beach. 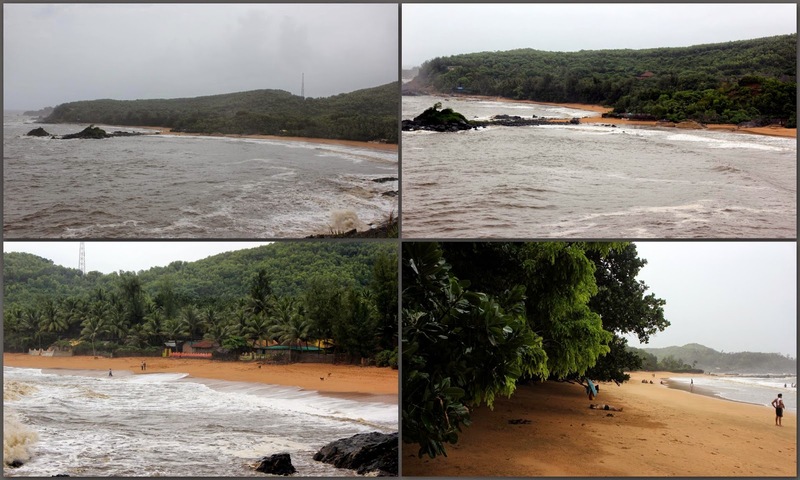 Kudle beach was completely covered with water and didn't seemed to be safe compared to other beaches. By the time we reached the beach, it was completely empty. 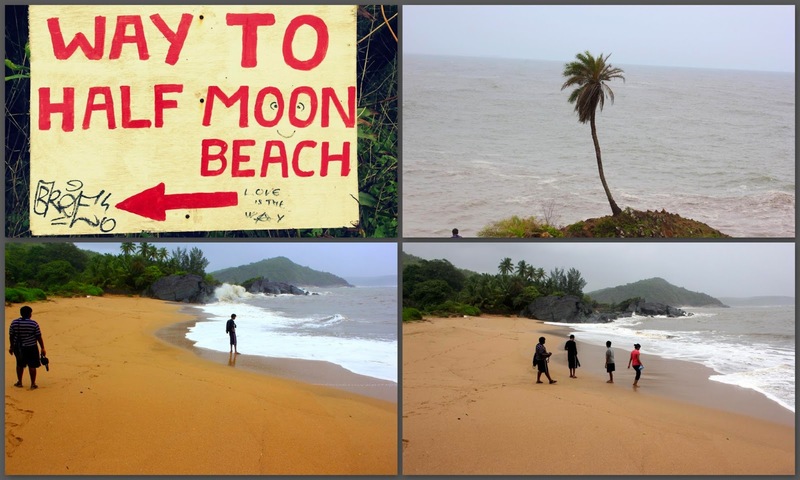 Kudle beach has no road access, only way to reach this beach is through trek. 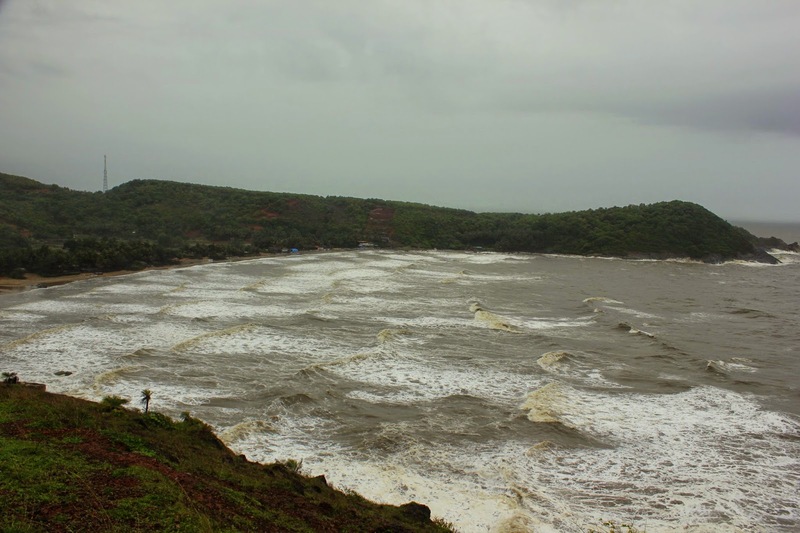 So kudle beach will be less crowded compared to other beaches in gokarna. After spending almost 45 minutes in Kudle beach, we started towards the om beach. We reached the other end of the kudle beach, climbed few steps and reached the top of the hill. From there we walked for 15 minutes and reached the entrance of the om beach. Since there are no sign boards or marking, we lost the way 3 times and some how able to find the route by ourselves. Finally we reached OM Beach. It is one of the best beaches I ever seen. Even though we went in monsoon, the beach is very clean. We went towards the intersection of the two beaches and spent almost 15 minutes enjoying the beauty of the OM beach. By the time we started from om beach towards Half moon beach, it was already 3 PM. Most of our trek mates were hungry and said that they can't trek more. Out of 15 people, only 5 people were ready to go further. We reached the other end of the beach and started walking inside the forest. The trail was so good and I felt that I was trekking inside a thick forest. We reached a point where the trail was split into three ways. Initially we went towards the right and we reached one beautiful view point. We spent few minutes there enjoying the beautiful views of om beach and again reached the same point. Next we went towards the second route and we reached the same point as previous. Finally we went towards the last trail and that was the correct one. From this point, the trail goes on the edge of the hill for some time, narrow thick forest trail for some time. Finally after trekking for 15 minutes, we reached Half moon beach. It is very small beach with clear water and clean sand. There was no one in the beach and I felt that I was in my private beach. Apart from the beach, I really loved the small village near the beach, with few huts surrounded by coconut trees. This is the perfect place for rave parties!!!! From half moon beach, we planned to trek till Paradise beach, but dropped the plan because of the time constraint and high tides. 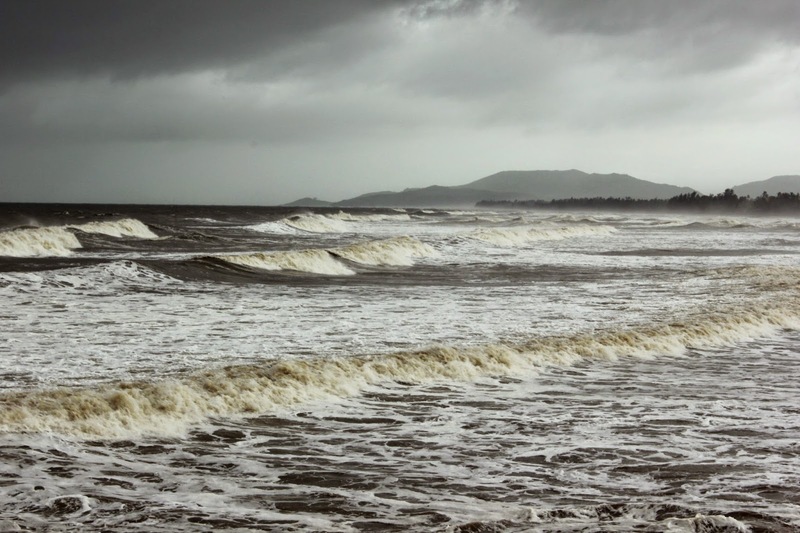 In order to reach paradise beach, we have to walk on the rocks located near the beach, which is almost impossible to do in high tide day or in monsoon. So we again trekked back to om beach, had some drinks and hired an auto to reach gokarna(7km on road). Finally we reached gokarna at around 6PM. I did many monsoon treks, but this is a different one and a must try during monsoon. Every year, during monsoon, I definitely visit dudhsagar waterfalls and sahayadri, from next year I going to add gokarna beach trek to this list. 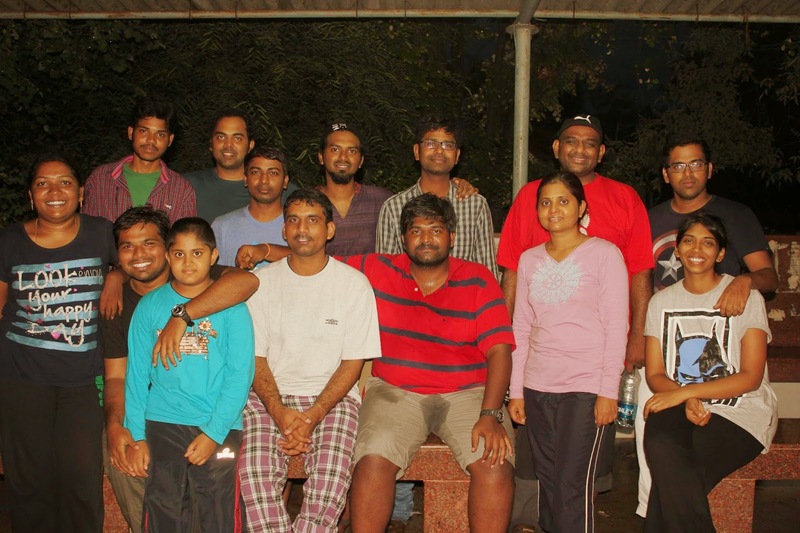 Thanks Prakash and TIC for memorable trek experience. Travelers can advantage Nepal Bhutan Tibet tour packages to make the nearly everyone of their trip to this comprehensive nation. These packages include itineraries as well as moving, guided excursion, meals and accommodation facilities.